Burn Stewart Distillers has released a rare, one off malt to key international markets - Ledaig 42YO, a robust, smoky malt whisky with a rich and distinct history. 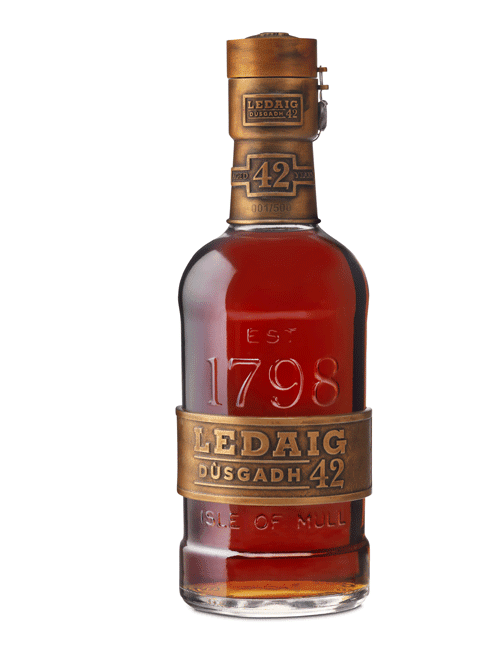 Named Dùsgadh, meaning ‘awakening’ in Scot’s Gaelic, reflecting the long, dormant period of maturation, this is the rarest and oldest Ledaig ever released and the next 40YO Ledaig single malt won’t be available until 2036. The story of handcrafted Ledaig 42YO begins on the Isle of Mull at the Tobermory Distillery, the only distillery on the mystic island and amongst the oldest commercial distilleries in Scotland. The malt’s old world charm reflects the brand’s spirit to do things the traditional way, by hand. In a rare feat of master blending, this Single Malt Scotch Whisky has retained all of its deep, peaty intensity, which is almost unheard of for an expression of this age. Throughout its four decade history, the Scottish landscapes and climates to which Ledaig 42YO has been exposed, have strengthened the malt’s distinctly rich and smoky flavour.